Voters are rallying behind the immigration-sceptic Finns Party according to Yle’s latest political barometer, which shows the group with 15.1 percent approval. The party posted a 1.8-percentage-point gain in the poll to outstrip Prime Minister Juha Sipilä’s Centre Party and grab third place as the country’s most popular political force. According to research director Tuomas Turja of pollster Taloustutkimus, the growth in backing for the Finns Party was especially due to so-called "sleeping voters" gravitating toward the nationalistic group. "The Finns Party are now getting more supporters from those who didn’t know or didn’t want to say which party they voted for in the 2015 election," Turja added. Meanwhile the National Coalition Party led by Finance Minister Petteri Orpo retained its second-place ranking with 15.8 percent approval, down marginally by 0.4 percentage points from a previous poll released on 7 March. At the same time, the NCP has narrowed the gap with the SDP. According to Turja any confusion caused by the SDP’s stance on meat consumption was not reflected in the outcome of Friday’s survey. "The last week of measurement was the best for the SDP," the researcher noted. Juha Sipilä’s Centre Party saw a marginal bump in its approval rating, which edged up by 0.3 percentage points to 14.4 percent but was pushed into fourth place by the rise of the Finns Party. Just one day after the last Yle poll, Sipilä marched to President Sauli Niinistö’s residence at Mäntyniemi to announce his government’s resignation over its failed social and health care reform programme. Reports indicated that the PM’s decision to quit government had affected the party’s election campaign. However the pollster did not see much evidence of this in the survey. "The weekly results show that the support for the Centre rose in the week after the government’s resignation. However after that it has remained unchanged. There was no evidence of a major spike," Turja commented. 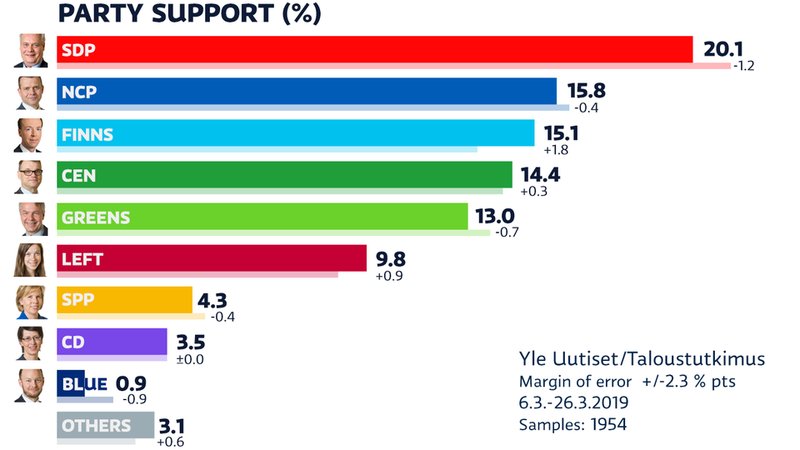 Now in fifth place in the party ranking, the Greens have the support of 13 percent of voters, down 0.7 percentage points from the previous poll three weeks ago. Immediately trailing in sixth place, the Left Alliance saw a slight rise of 0.9 percentage points to settle at 9.8 percent voter backing. Taloustutkimus speculated that poll respondents may have switched allegiance from the Greens and the SDP to the Left. According to Turja, all of the changes in Friday’s poll fall well within the survey’s margin of error of +/-2.3 percentage points. 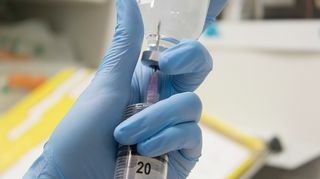 He noted that the margin of error is somewhat larger than usual because the sample size was smaller and the survey period was shorter than before. "The fact that we see four parties separated by less than three percentage points is a very different situation than two years ago, for example," she pointed out, referring to municipal elections that took place in 2017. "We can see a very European development there. The landscape is fragmenting and no one party alone has the top position," she added. "In many ways, support for the Finns Party is difficult to forecast. But it could be that the party could once more surprise us during the election," Vuorelma said, adding that minimal polling differences among parties also makes government negotiations trickier. Since the beginning of the year, Taloustutkimus has calculated the number of MPs parties would seat based on successive polls, compared to their current representation in parliament. The calculations have been based on poll results gathered over the past six months, which means that the projected number of seats may differ from individual survey outcomes. Based on current calculations the SDP, which has been leading in the polls, would win 13 additional seats, easily making it the largest political party with 47 MPs. The pollster Taloustutkimus interviewed just under 2,000 respondents for the survey between 6 and 26 March.